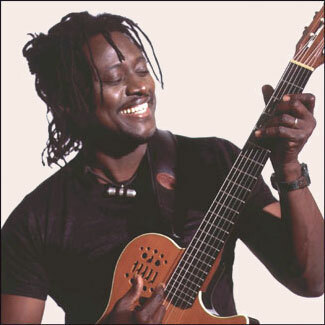 For nearly two hours on a Tuesday evening in February, Malian guitar virtuoso Habib Koite and his six-piece unit, Bamada, brought a level of ensemble mastery to Memorial Hall in Shelburne Falls, Massachusetts, that would have been the envy of any world class chamber group. The sold-out performance was part of the eclectic Hilltown Folk series, which increasingly draws folk and world music headliners to the upper Pioneer Valley. At concerts of predominantly amplified instruments and voices, I consider it just short of miraculous if the sound gets tolerably balanced within ten or fifteen minutes. From the beginning, Bamada’s balance was impeccable, offering crystal-clear definition to each instrument’s personality and their polyrhythmic conversations. With hindsight, I shouldn’t have been surprised—polyrhythmic and textural clarity are central to Koite’s musical agenda. Fronted by Habib’s beguiling voice and his nuanced, amplified acoustic guitar work, Bamada—which means mouth of the crocodile—also featured the 73-year-old virtuoso Keletigui Diabate on violin and balafon—a wooden-key African cousin of the xylophone. The other musicians were Boubacar Sidibe on guitar and harmonica, Abdoul Wahab Berthe on electric bass, Souleymane Ann on Western drum kit and calebas se (calabash), and Mahamadou Kone on talking drum and a grab bag of percussion instruments. From Bamada’s first note, polyrhythms ruled the day. This is one extraordinary polyrhythmic machine, I told myself. But the machine metaphor didn’t do the band justice, because its interplay was utterly organic. In that seamless cohesiveness, Koite’s own musical personality was central. From his dreads-in-motion image on posters and cds, you’d expect a wild and crazy stage presence. Not for a moment. On stage, he was humility incarnate, providing through leadership and musicianship the unifying force that kept Bamada’s musical ingredients in sync. Koite’s characterization by publicists as the African Eric Clapton is more marketing invention than musical reality. Like Clapton’s guitar work , Habib’s was technically masterful and nuanced, but the similarity ended there. Clapton crafts lengthy lines that move toward harmonic-rhythmic payoffs. Koite’s largely nonlinear approach dwelled within each chord, exploring its anatomy through ingenious combinations of rhythms, trills, and note juxtapositions. In addition to traditional Malian motifs, Koite’s playing incorporated stylistic ingredients from flamenco, Afropop, samba, and American jazz and blues. But his guitar lines rarely resolved according to Western harmonic expectations. Instead they found resolution through fleeting melodic riffs that often dovetailed with ingenious intersections of rhythms, timbres, and dynamics. Koite’s gorgeous three-octave voice was no less distinctive. With the burnish ed quality of teak or rosewood, it consistently emerged from Bamada’s instrumental fabric, leading the band forward. And it drew periodic vocal responses from other band members, who sang in unison or one- and two-step intervals. On balafon and violin, seventy-something Keletigui Diabate was the band’s big improvisational risk taker. His playing packed more linear punch than the leader’s. At the same time, Diabate piled up notes vertically in inventive rhythmic combinations. Three-quarters through one of his too-infrequent violin solos, Diabate joined forces with Koite in an improvisational duet with Habib perfectly echoing his senior’s increasingly complex phrases. The escalating energy was a high point of the concert. Another galvanizing presence was the percussionist, Mahamadou Kone, who employed a curved wooden beater to produce riveting percussive accents (including elastic changes in pitch) from a talking drum. At times, the mercurial Kone bounded about the stage, stoking the energy levels of the other musicians. By blood line and vocation, Koite is a griot—a Malian song-story teller who musically transmits Malian cultural myths and history. That history spans centuries and encompasses dynasties of former monarchs who ruled what was once one of west Africa’s most powerful kingdoms. Many griots were court musicians who deployed bardic song to celebrate the kings, their ancestors, and Mali’s rich cultural traditions. 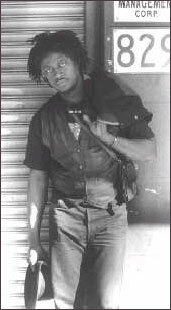 Koite’s music continues that exploration and current topics like urbanization and the evils of cigarettes. Few in the hall, of course, had a clue about what Koite was singing. But no one seemed to mind. Bamada’s energy level and ensemble playing were continuously compelling. 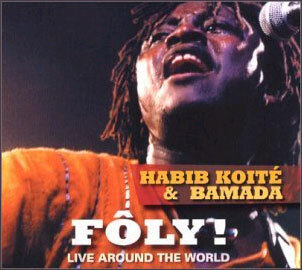 Koite and Bamada share exalted company with fellow Malian Rokia Traore, who like Bamada combines traditional and modern elements with exquisite ensemble playing. When I heard Rokia and her band at the Iron Horse in Northampton, Mass. several summers ago, I was bowled over. 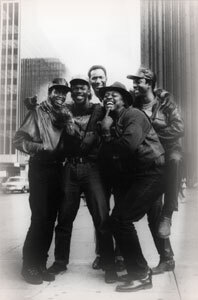 For me, their ensemble work and strategic deployment of every musical element was revelatory. This is a fresh, new aesthetic, I told myself, that stands with the best music-making that any culture or genre has to offer. On February 1st in Shelburne Falls, it was a blessing to revisit that aesthetic through the inspired performance of Habib Koite and Bamada. The next best thing to being there is hearing Koite’s double record concert cd-Foly! Live around the World-on the World Village label. The disc’s eighteen tracks offer unabridged performances, many of which exceed ten minutes. And Foly! is priced at two discs for the price of one.